Created in 1992 by Solara in New Mexico, USA. The Sacred Spiral Dance is the map of our journey into One True Love. During this Dance, we move in two spirals towards a central point. Together we form the symbol of the One Heart. Our partner in the spiral opposite us represents our Lover from Beyond the Stars. When we meet our partner in the center, we reunite as One True Loves and the two become ONE. Then, as our newly formed One Being moves out of the center into the Spaces-In-Between the two incoming spirals, we enter the passageway to PURE HEART TRUE LOVE. At the end of the Dance, we all join together in one large circle as One Being embodying PURE HEART TRUE LOVE. When we reach a certain level of mastery in the Sacred Spiral Dance, there is a sparkling iridescence in the air and we are able to perceive each of the two spirals as triple overlays. This is the sign that we have totally entered the Spaces-In-Between (the Ultra Greater Reality). Music for the SACRED SPIRAL DANCE: Now available on CD or by Download. Choose a partner who represents your Lover from Beyond the Stars. Now form one long double line of all the partners facing the same direction. We now have two long, single lines. Everyone’s hands are in the PURE HEART LOVE position. The leading couple begins slowly walking in a clockwise direction, lifting each knee to hip height, placing each foot softly on the floor in a diagonal position pointing outwards and gently sliding into position. This walk is done in unison with a gently flowing motion from side to side. Each dancer tries to place their feet in the exact spaces previously occupied by the dancer in front of them, further strengthening our One Being. Halfway across the room / space, the first dancer of the outer line of dancers will stop and face inwards with the rest of his line doing the same. Their partners in the inside line continue on with the slow, flowing step until the first dancer reaches the point exactly opposite their partner. The inside line then stops and faces inwards. The two single lines will form two elongated spirals beginning on the right of the first couple. As the partners in the opposite spirals align with each other, they slowly open into the One Heart where they remain for the rest of the Dance. From this point onwards until we reach the outer circle of PURE HEART TRUE LOVE, we will only look at our partner. As the music starts to play, the first couple begins the dance by moving in a clockwise direction, always remaining totally focused on their partner. The actual step is one of raising the left leg with bended knee and moving it to the left with a smooth dipping motion. Then bringing the right foot in towards the left. This is followed by a pause of random length which is determined by the lead couple of this dance. Since one of the purposes of this Dance is to take us into the Spaces-In-Between, (the Ultra Greater Reality), our steps will not necessarily follow the beats of the music. This necessitates that each spiral aligns as One Being. We need to feel as though there is an invisible membrane connecting us to the dancers on both sides of us. If we do this, we will automatically take a step to the left each time the person on our left moves. It’s important to not let gaps form in the spirals, which will happen if we let the dancers on either side of us get too far ahead or behind. The two lines of dancers slowly spiral into the center. Don’t be in a hurry to reach the center. Be careful to leave sufficient space between the incoming spirals to create the Spaces-In-Between. When the first couple reaches the center of the spiral, they lightly touch fingertips. Then, remaining together at the fingertips, the two reunite as One True Loves and become One Being, reversing their direction, they spiral outwards in a counterclockwise manner within the Spaces-In-Between the ingoing spirals of dancers. Because the couples spiraling outwards are facing each other, one person will continue stepping to the left, while their partner from the other spiral will now be stepping to the right. As each couple enters the centerpoint, they touch fingertips, becoming One Being and follow the first couple spiraling outwards counterclockwise in the Spaces-In-Between. This outwards spiraling continues until you have reached the outside of the two ingoing spirals. 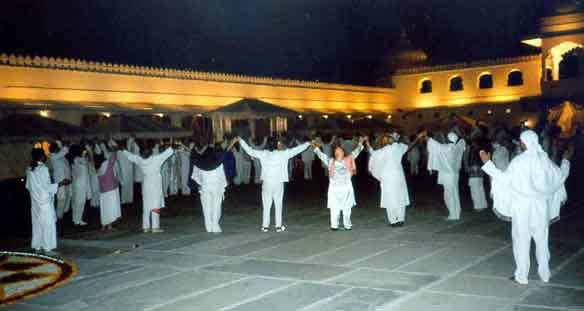 As the first couple arrives at the outside of the dance, they form the beginning of a new outer circle by linking little fingers of one hand and facing inwards while continuing the sideways dance step in a counterclockwise fashion, keeping their arms upraised at the sides with palms forward. They are thus forming the circle of PURE HEART TRUE LOVE. Each couple who arrives at the outside of the dance, joins with the outer circle by linking themselves together with their little fingers. Once you are in the circle of PURE HEART TRUE LOVE, you can now look at everyone in the outer circle, experiencing everyone as your One True Love. This continues until everyone is in the outer circle. 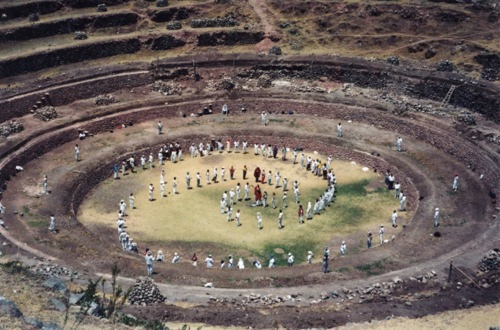 The last couple closes and completes the circle by linking little fingers with the first person in the outer circle. When this happens, often we will stop dancing and raise our arms upwards for a minute or so, before continuing on with the dance. Now the Sacred Spiral Dance moves to a new level of sublime ecstasy as you continue dancing counterclockwise as one synchronized, organic whole. It’s important that you maintain the subtle focus of this dance by keeping it slow and quiet. There’s often so much energy that it’s easy to get rowdy at this point and disperse all the energy. But if you keep it deep and subtle, you will be triggered into sublime ecstasy. If it feels appropriate, you can drop hands and move into free form, ecstatic dancing, feeling your entire being now fully anchored in the Spaces-In-Between.